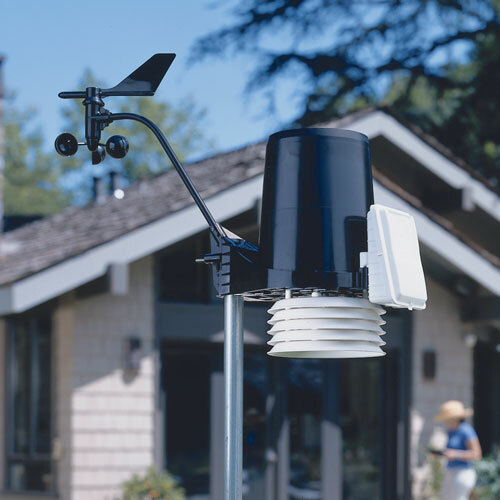 The Vantage Pro2 weather station includes an integrated sensor suite, which combines rain collector, temperature and humidity sensors, and anemometer all into one package, with a large LCD display for forecasting and on-screen graphing. The 100-6152C Vantage Pro2 Cabled Weather Station offers forecasting, on-screen graphing, and much more, all on a large 3-1/2" x 6" (90 x 150 mm) LCD display. Quick view icons show the forecast at a glance - sunny, partly sunny, cloudy, rain, or snow - while a moving ticker-tape display gives more details. Mostly clear with little temperature change? Increasing clouds and cooler with precipitation within four to six hours? Whatever the forecast, Vantage Pro2 will let you know. Backlit display for easy viewing. Mounts on desk, shelf, or wall. US and metric units of measure. Optional data logger must be ordered separately. The Vantage Pro2 includes an innovative integrated sensor suite, which combines rain collector, temperature and humidity sensors, and wind speed and direction sensors all into one package, making setup easier than ever and improving performance and reliability. Wind sensor is detachable for ultimate flexibility. Mount with integrated sensor suite, or mount separately using the included 40' (12 m) cable. Rain collector with self-emptying tipping bucket is exceptionally accurate. Read rainfall amounts in 0.01" or 0.25 mm increments. Temperature and humidity sensors are located inside the radiation shield. The shield protects the sensors from solar radiation and other sources of radiated and reflected heat. The optional tripod (must be ordered separately) makes installation even easier. Brackets on the legs tilt to mount on roof or uneven terrain. Diffuser element and housing are carefully designed for accurate cosine response. Silicon photo diode provides good match to solar spectrum. Includes built-in level and 3' (0.9 m) cable. Measures the sunburning portion of the UV spectrum. Allows you to display UV index, dose rate, and daily and accumulated dose. Includes 3' (0.9 m) cable. 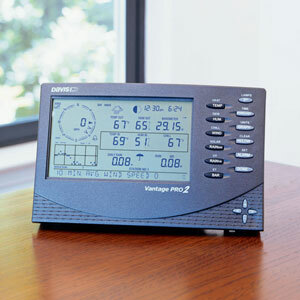 For weather data collection, analysis, and display, connect Vantage Pro2 to your personal computer. 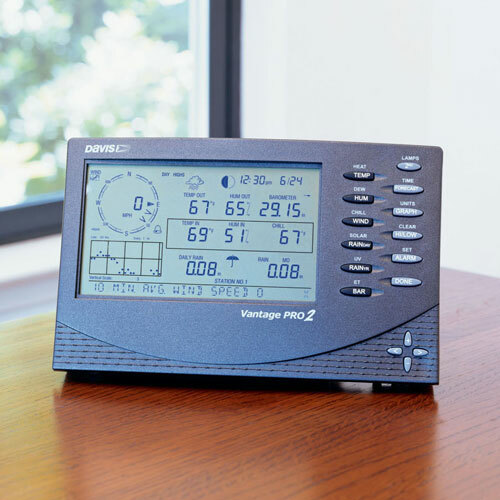 The WeatherLink data logger fits neatly into the Vantage Pro console, storing your weather data even when the computer is off. Transfer data to the PC when you like. Later, use the software to create graphs, generate summaries, and more, all with your own weather database. WeatherLink lets you share your weather with the world on your own weather web site. WeatherLink software establishes the Internet connection and transfers the files using FTP.